Rent villas and apartments in Sri Lanka with private pools. Book affordable holiday rentals that are near a beach and golf course. The best-located spacious beachfront property rental in Hikkaduwa with a private swimming pool! We can accommodate 6 adults. Private luxury villa with pool A/C & fans. 3 king size ensuite bedrooms. Beautiful tropical walled garden. Free WiFi, Chef/Villa Manager, cleaning. Easy access to all Hikkaduwa has to offer. The Nature Villa is a Six AC bedroom self catering private and peaceful family holiday villa located in Pathana, Hikkaduwa Sri Lanka. This villa has a large private swimming pool & a kids pool. 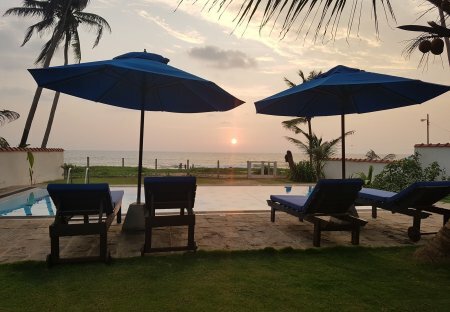 If you are looking for a Amazing Holiday experience in a luxury Holiday Villa in Hikkaduwa? You have reached to the right place. Its HikkaResort - Grand Expression or Luxury. 4AC Bedroom Villa with 3 bathrooms for rent in Hikkaduwa. Distance to beach is 1.5km. This villa has private swimming pool with sun beds and outdoor chairs, table etc. Garden is great for relaxing. Two single BR apartments with two separate entrance. Both apartments has AC, TV, WIFi & Hot water. We also have a swimming pools which can be used by the renter. Discover true luxury and tranquility when you reside in Aqua Dunhinda. The private villa is located in a scenic tea garden over-looking the Kotmale Forest and the Mahaweli River. This villa has 3 Air-conditioned bedrooms with 3 attached bathrooms with amazing pool view. Distance to Hikkaduwa beach is 1.5km or 15min by walk or 5min by 'tuk tuk' Taxi. 4 A/C bedroom family Holiday Villa,shared swimming pool, western style bathrooms, Only 900 meters from one of the best snorkeling's, diving and surfing beaches in Sri Lanka. The 'HikkaHome' is a five AC bedrooms self catering private and peaceful family holiday villa located in Hikkaduwa, Sri Lanka. This is a brand new massive holiday villa which has all facilities. A picturesque villa with pool nestled against a backdrop of Sri Lankan rainforest, surrounded by wildlife, and yet a only a very short walk to the many restaurants, bars, sights of Unawatuna Bay. 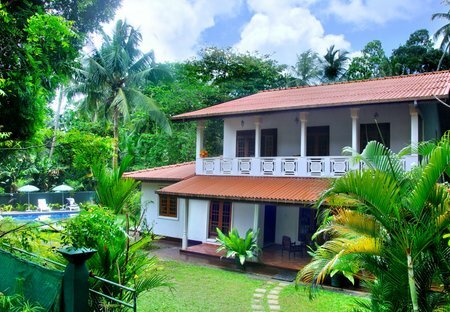 Authentic Sri Lankan homestay experience in a beautiful self-contained balcony apartment. Two AC bedroom, beach apartment for rent in Hikkaduwa. This is a great holiday beach apartment for a private and relaxing holiday. This apartment is located on first floor of sea facing property. Your own tropical holiday home in paradise! Perfect for families or parties of 6 or more people. We also rent room only as a guest house (contact owner for availability and room only rates). The Clover is a beautiful apartment situated in Maya Avenue Colombo, with over 1100sqft of space with two bedrooms and two baths.